It also sounds very food friendly for pre-dinner noshes. Yeah, it's excellent, and obviously can change dramatically depending on the sherry/vermouth combo used. A sweet vermouth version is the Adonis. 2 Oz. Jameson (I would add more), 3 Oz. Ginger Beer, 1 Oz. Lemonade and a slice of lemon! A little sweet but very refreshing. Yeah, or just freshly squeezed lemon juice in lieu of lemonade. Like with most "mixers," ginger beer runs the gamut from sweet and treacly, to less sweet and more spicy. For summer cocktails on the tarter side, there's La Paloma - grapefruit soda, tequila and lime juice. I use the San Pellegrino Pompelmo, but use the one you like best. I'm also a fan of the Badminton Cup. This is something they used to serve at Greyz and I finally figured out how to replicate the drink: 1 ounce lime juice, .75 oz simple syrup, 2 ounces of gin, 4 or 5 slices of cucumber, 7 or 8 mint leaves. Combine everything but gin and muddle cucumbers and mint, add ice and gin. Shake vigorously and serve. You can add a splash of seltzer if you like. The drink has a lot in common with the cucumber collins. Bartenders hate it when you order a pousse cafe. Almost as much as a Ramos (provided they know how and can actually make one). 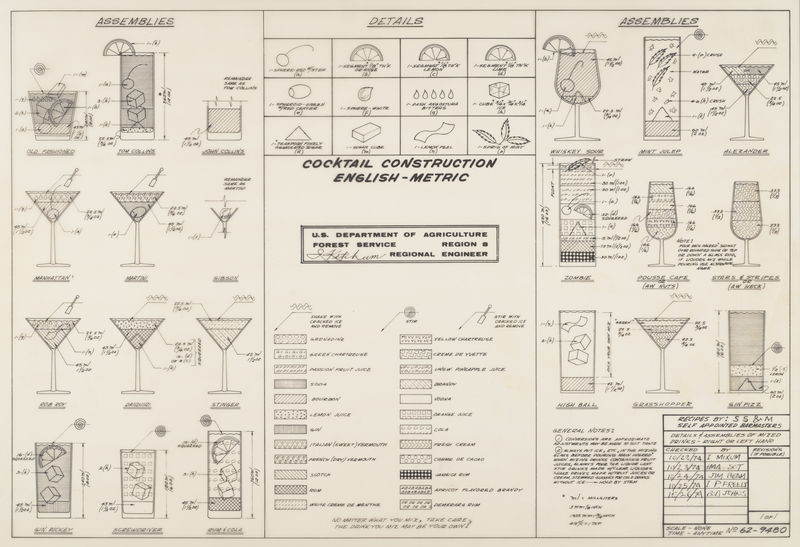 I didn't realize 2:1 was still the standard ratio for Manhattans and Martinis even as late as 1974. I am going to try to get this printed, I think. The size is confusing, though – the PDF version indicates that the print size is 21.6528" x 14.7917", which doesn't correspond to any size I'm familiar with. I wonder if that "Aw Nuts" is on behalf of the bartender. For Manhattans, I like to think it still is...and I like Martinis this way too. I just remember a few years ago the bartender at Saxon & Parole confirming my order as a "wet Manhattan" when I asked for it as 2:1. Randomly, Saxon & Parole is serving a mean Manhattan on tap right now. Although I have to order my Martinis "wet" to get that proper proportion.